This essay is in three parts, of which this blog post is the first. Click these links for parts two and three. I've been waiting a long time to write this essay. I thought of it four or five years ago when I was writing a series of posts about natural storytelling. I never wrote the essay because other projects got in the way, but it has been at the back of my mind all this time. I'm excited to finally bring these thoughts to you. One of the reasons I've come back to Michael Ende's novel The Neverending Story several times over the past thirty-some years is that it's a guidebook for life. Yes, it's a children's book, but it's also a coming-of-age story with an important lesson that I find myself in need of revisiting from time to time. If you haven't read The Neverending Story, what I have to say about it will pretty much ruin the story for you. So choose now: go away and read an amazing book, then come back; or read on, and abandon all hope of experiencing the story with an open mind. Most people (especially those who have seen the monstrously evil movies) think The Neverending Story is about a boy named Bastian Balthazar Bux who saves an enchanted world hidden inside a magical book. But that's only the setup for the real story, which is about Bastian's journey after he saves Fantastica. The central message of the book can be found in AURYN, the amulet Bastian is given by the Childlike Empress. When Bastian first receives AURYN, he understands right away what it means. By saving Fantastica, he has gained the magical power to do anything he wants to do. He has become the most powerful and the least constrained creature in the infinite realm of Fantastica. But as he travels through the story, without realizing it, Bastian explores the meaning of each word on the amulet, in reverse order. The first thing Bastian learns is how to Wish. Like the fascinated child he was before he lost his mother, he learns to release his imagination and explore endless realms of possibility. Next Bastian learns about You -- that is, about himself. As if in a dream, he uses his imagination to work through the things he hopes for, fears, values, and disdains. He learns who he is and what he wants. But at this point he has only a superficial understanding of these things, a catalogue of characteristics. He has no center, no essence. Next, through a series of painful mistakes, Bastian learns to make hard choices about What kind of person he wants to be. He learns that he can't always have and be everything at the same time. He learns that trying to help someone without understanding what they really need can hurt them. He learns that following one path closes others. He learns how to choose. Finally, Bastian learns what he must Do in order to achieve what he has chosen. Gathering his courage, he endures a series of challenges that strip him down to the bare essence of what he truly wanted to be all along: a beloved son, a selfless friend. It is in this final stage of the book that the true meaning of the amulet's inscription becomes clear. "Do What You Wish" doesn't mean "do anything you want." It means exactly what it says: do what you wish. Other than the Golden Rule, I can't think of a better guide to living well. As much as I love the central message of The Neverending Story, it's not what I want to tell you about today. The Neverending Story is also a treatise on stories and storytelling in contemporary society. I had a suspicion about this dimension of the work two readings back, so the next time I read the book, I stuck pieces of paper into it wherever I felt Michael Ende was making a point about storytelling. Recently I went back to my forest of markers and thought about what they meant. This essay (which is only just now starting) is about what I think they mean. Michael Ende’s decision to move to Italy was closely bound up with the censorious attitude to escapist art in Germany. For Ende as a writer, the rejection of escapism was ‘suffocating in the extreme’. Literary critics favoured books that were socially conscious and politically instructive, and dismissed fantasy literature as ‘mere escapism’. Even Ende’s friends found fantasy literature somehow questionable, and Ende soon tired of having to justify himself and his work. The Neverending Story began with an idea on a scrap of paper in a shoe box about a boy who gets lost in a book. But the book grew into something much more ambitious: Ende's answer to his critics. It was his best attempt to prove that fantasy literature has real value in human life. The reason I find The Neverending Story so amazing, and the reason I'm writing this essay, is that I also think Ende set out to prove that personal storytelling has real value in human life. He was particularly intrigued by the way in which everyday circumstances were shaped into intricate rituals, such as the tea ceremony. If people forget that they have an inner world, then they forget their own values. The inner world must be added to the exterior world, it must be created and discovered. And if we do not, now and then, make a journey through our inner life to discover these values, they will be lost. Personal storytelling is part of how we create and discover our values, and we do it by journeying through our inner worlds. This diagram summarizes my interpretation of The Neverending Story. In the rest of this essay I'll explore its implications in the novel and in personal storytelling. Fantastica, the world Bastian travels to when he enters The Neverending Story, is the world of the imagination. Everything that can be imagined or created lives here. Rock-chewing giants transform mountains into Swiss-cheese shapes; a tiny man rides a racing snail; there are centaurs, vampires, werewolves, ghosts, and pixies. But Ende doesn't set Fantastica completely apart from reality. It exists in parallel with the real world. It's like one of those Star Trek plots where the character everyone thinks has died is really right there but in a parallel plane, and they just need to find the right transverse polarity matrix (or whatever, you look it up) to be seen again. The here-and-not-here state of Fantastica results in its having no borders. Atreyu, the apparent hero of the first half of the story, spends most of his journey trying to leave Fantastica, only to find out that there are no borders to cross. I take the borderlessness of Fantastica to symbolize the fact that imagination is not something we can enter and exit. Our adult feeling of having left behind our imaginations in childhood is an illusion. Imagination works its way through all of our days, from childhood to old age. Even when we ignore it and deny it, we can't run away from it or put it away, because it is part of who we are. To imagine is to be alive. This is why Ende's name for the symbolic counterpart to Fantastica is so surprising. It represents the part of human life that lies outside the imagination: facts, opinions, options, plans, tasks. Several characters in the book refer to this other world. They call it "the human world." I've spent some time puzzling over this curious name. Why didn't Ende call the other world "Rationalica" or "Realica?" Why did he give the non-imaginative world a name that describes all of human life, as if imagination were not part of human life? Another interesting thing about "the human world" in The Neverending Story is that Ende never describes it. The book's characters mention it, but they never talk about what it's like. They speak of it with fear and sadness, as a place of poverty and hopelessness, but they never give it a visual description. "The Nothing," the phenomenon that appears in places where the human world intrudes into Fantastica, is the closest The Neverending Story comes to describing the human world. The Nothing drains life of color, sound, and the will to live. The world past the portal must be made of the same stuff: nothing. This is an extreme caricature of the world of reason, but it makes a point: human life drained of imagination is not worth living. Ende chose these recognizable characters for Atreyu's story because he wanted to signify that it takes place in the public imagination, a shared space where stories play out in the entire society. Until the moment when Bastian gives the Childlike Empress a new name, the book reads like a compendium of folk tales. This is no accident. Ende was well versed in folk traditions, and he knew what he was referencing and why. The characters in the second half of The Neverending Story, by contrast, are uniquely detailed and relevant to the circumstances of Bastian's life. The lion Grograman, with his alternating cycles of life and death, connects to Bastian's recent loss and to the possibility of a new relationship (a "night forest") with his father. The Acharis/Shlamoofs are beneficiaries of Bastian's blundering largess and naïveté. Dame Eyola represents the unconditional acceptance he has lost. The seafaring Yskalnari represent the friendships he would like to deserve. And so on. These characters are elements in Bastian's private, personal imagination. Like our own personal stories, the characters of Bastian's imagination don't travel well. They aren't meant to. Bastian's journey is a cycle that begins in his personal reality, moves into public reality when he enters Mr. Coreander's (a stranger's) book shop, crosses over into public imagination with his opening of the stolen book, draws on his personal imagination to work his way through the challenges in his life, and ultimately returns to his own personal reality with a new set of truths about who he is and what he wants. This is a virtuous cycle (rather than a vicious cycle) because it leads to an upward spiral of benefits for Bastian and his father. 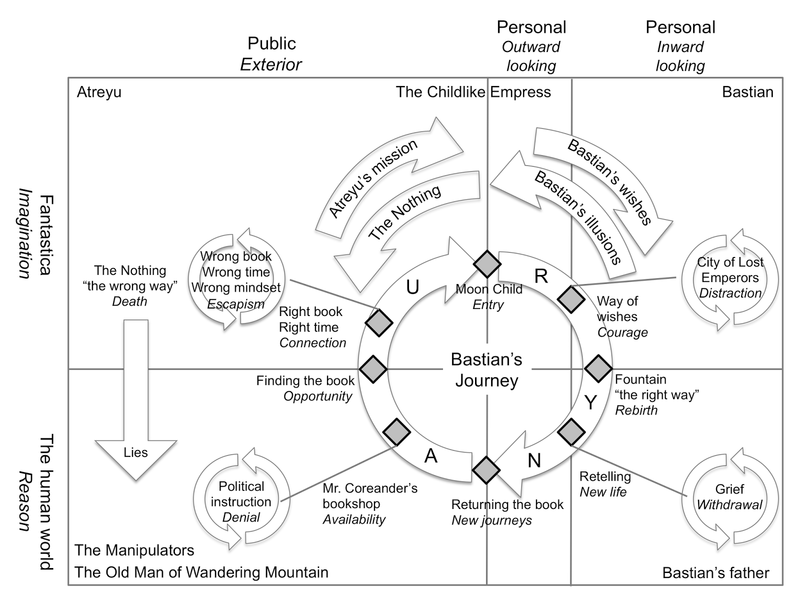 I see eight turning points (as marked on my diagram) where the virtuous cycle of Bastian's journey could have gone a different way. Bastian discovers Mr. Coreander's mysterious bookstore. Prior to this day, it is assumed, Bastian found no such enabling place or person, and was trapped in the vicious cycles of denial and withdrawal. Mr. Coreander allows Bastian to "steal" The Neverending Story, granting him the opportunity to escape the cycles that limit his imagination. The Neverending Story turns out to be the right book at the right time for Bastian. By finding and reading it just now, he escapes the cycles of denial and withdrawal and avoids entry into the cycle of escapism. After reading Atreyu's tale of adventure, Bastian renames the Childlike Empress, crosses the boundary between public and private imagination, and recreates Fantastica. After a series of mistakes and misadventures, Bastian arrives at the City of Lost Emperors, is warned by the monkey Argax about his impending fate, and begins to choose his last wishes wisely. Bastian fails to find his way home, but Atreyu vouches for him at the fountain inside AURYN and saves him from the cycle of distraction. Bastian returns to the world of reality and tells his story to his father, delivering him from the cycle of withdrawal in which he had been trapped. Bastian returns the book back to Mr. Coreander, who tells him that he (and presumably his father) can return to Fantastica as many times as he likes. One thing you might notice in this list is that, except for the third turning point where Bastian connects directly with The Neverending Story, each turning point features someone helping someone else. Mr. Coreander and several fictional characters help Bastian, and Bastian helps his father. The story acts as a mediator and enabler, but it is the connections between people, real and fictional, that matter most. It's also interesting that Bastian is saved by Atreyu, a character from the public imagination, not his from his own imagination. This also implies a connection between people, because someone in "the human world" created The Neverending Story and made it available to Mr. Coreander. So you could say that every significant turning point in the story involves interactions between people. The most important turning point, as I see it, is when Bastian returns and tells his father the story of Fantastica. It is implied that his father not only appreciates the story but believes it. This act of acceptance by his father creates a new cycle in which Bastian can go on more journeys into the world of his imagination with his father by his side. This is Ende's "journey through our inner life." This is why we tell stories. It's why we read them, in novels like The Neverending Story, and it's why we share them with each other. Bastian emerges from his journey with a freshly swept soul, and so do we readers. This is true for all productive journeys through the personal imagination, whether they involve allegorical novels or other game-like experiences. People interact in imaginative, game-like ways throughout their lives -- planning a wedding or funeral, going on a long road trip, taking care of an infant, moving from one place to another, building a business, making friends, growing a garden. These are all journeys that can include or avoid the public and personal realms of the imagination. It is only when we take the risk of plunging into our imaginations that we come out changed. I would add, and I think Ende would agree, that sharing our personal stories, as Bastian did with his father, is an essential part of the imaginative approach to life. Now let's talk about the factors that play a part in Bastian's journey of the imagination. The ruler of Fantastica lives in her Ivory Tower at the center of Fantastica and at the center of The Neverending Story. She symbolizes our individual and collective capacity to imagine and play. Though she rules Fantastica, the Childlike Empress is not a Fantastican. This is because she is not herself an imagined being. She is the part of us that creates imaginary beings. The first part of the novel centers around the quest to save the Childlike Empress. Her deathly illness represents the loss of imagination and play in Bastian's life. Bastian used to make up stories, and he used to play, but since his mother's death, all of those things have disappeared from his life. Bastian's father is the one person who could bring Bastian into a more imaginative future, but he has retreated into the colorless world of his own grief, with his white lab coat and his white dental fixtures. The Neverending Story centers on the loss of imagination in Bastian's life, but there are several hints at a similar loss in the society he lives in. Bastian lost his childhood friend Christa to a "better for her" boarding school. Michael Ende himself called his school years a "long grey prison sentence" (there's that lack of color again). Other characters such as Gmork and the Manipulators hint at a lack of imagination in the larger world, and these work to weaken the Childlike Empress as well. When Bastian gives the Childlike Empress a new name, he begins to heal his shattered world, and by extension, the world around him. The splendid colors of the new Fantastica contrast with the previously muted color schemes and signify the power of the imagination to transcend and delight. I'll have lots more to say about the Childlike Empress later in the essay, but I need to go through some other things before what I have to say about her will make sense. The most important force that guides the plot of The Neverending Story is AURYN, an ouroboros symbol. In order to understand the meaning of this symbol in the book, we need to understand the meaning of the ouroboros symbol in general. The ouroboros depicts one or two snakes (or, less often, dragons), arranged in a circle, biting their own (or each other's) tails. It seems to have arisen around 3000-1000 BCE in several cultures (Egyptian, Indian, Greek, Aztec, Norse, Chinese). Some believe it arose independently in at least some of these places; others believe it could have spread through migration and trade routes. 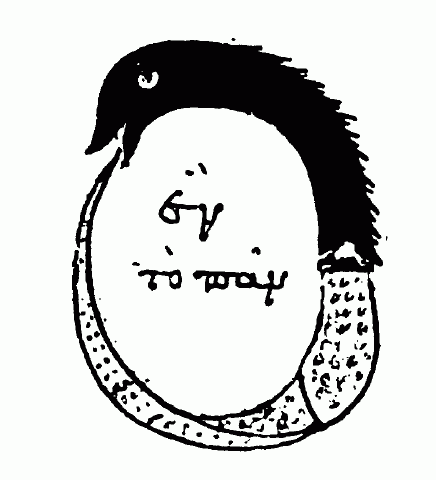 The ouroboros is associated with infinity and with cycles of death and rebirth. But its strongest association is with nonduality, the paradoxical unity of apparent opposites. When a snake eats its own tail, it sustains itself and suffers injury at the same time. When two snakes eat each other's tails, each snake sustains and is sustained by the other snake while both snakes suffer injury. This symbolizes the paradoxical and complementary nature of many aspects of human life: day and night, summer and winter, youth and age, birth and death. 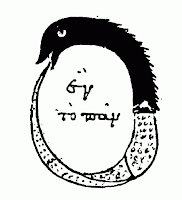 One of the most famous ouroborus images (shown here) is from an ancient Egyptian alchemical textbook. In the center of the snake, which is black on its head and white on its tail, are the words hen to pan, or "one is all." If that sounds familiar, it's because another well-known symbol represents the same concept: the yin-yang symbol of Taoism. A historical connection between the two symbols has been discussed, though it's impossible to know if there is a direct link. An ouroboros can be found in The Neverending Story in four places: on the physical book we read; on the book Bastian reads; on AURYN, the amulet Bastian receives on his way into Fantastica; and on the fountain Bastian passes through on his way back to reality (which is actually inside AURYN). Thus the ouroboros symbol marks Bastian's circular journey into and out of the land of Fantastica. The book we hold draws us into the book Bastian holds, which draws him into Fantastica and into a journey guided by AURYN. Eventually he goes even further into the story by entering AURYN itself. Passing through the fountain, he returns to his world, gives The Neverending Story back to Mr. Coreander, and completes The Neverending Story, the book we've been reading. I've read that Michael Ende campaigned energetically to get his actual book to resemble the book inside it. Clearly this was to make the encircling of our journey around Bastian's journey as clear as possible. The original hardcover German edition was apparently bound in copper-colored silk with the ouroboros embossed on it, just like Mr. Coreander's copy. My English hardcover copy is copper-colored, but it's not silk and it has no ouroboros on it. There's an ouroboros on the book jacket, but it's a small consolation. The paperback version (which Ende hated) breaks another element of the recursion: its text is not written in alternating sections of red and green, as Mr. Coreander's book was, but in alternating sections of plain and italic text. Just as in its historical usage, the ouroboros in The Neverending Story has two meanings. Its lesser meaning lies in the entanglement between imagination and reality. Let's consider it first. The Childlike Empress gives AURYN to Atreyu because as a Fantastican (that is, a fictional character) he cannot reach Bastian without it. I said above that the characters in Atreyu's story are recognizable folk tale tropes. This is true, but because AURYN represents the meeting of imagination and reality, it is able to guide Atreyu toward characters and situations that connect with the problems Bastian faces in real life. Like Bastian, Morla the aged one faces abandonment. The Swamps of Sadness, where Atreyu loses his beloved horse Artax, connect with Bastian's feelings about the loss of his mother. Even Uyulala, the disembodied voice, reflects how Bastian feels about his disconnected life. This is AURYN's power in the first half of the book: to craft a story, played out by Atreyu, that connects with Bastian's need. When Bastian enters The Neverending Story, the Childlike Empress bestows AURYN upon him, and he uses it to create new links between his imagination and his reality. He needs the connection AURYN represents to bring his imagination to bear on the problems he faces. Thus AURYN's power comes from our capacity not only to imagine but to imagine fruitfully -- that is, to use our imaginations to meet our needs. Without AURYN, Fantastica and the Childlike Empress would remain isolated and meaningless. That's why the inscription on AURYN is so important: "do what you wish" is the link between imagination and reality. It is not our ability to imagine that saves us. It is our ability to do what we imagine, to bring imagination into reality, that creates the journey of rebirth. But as I said above, this is the lesser meaning of the ouroboros symbol in The Neverending Story. For a while I thought it was the symbol's only meaning in the book, but it didn't match the way AURYN works in the second half of the book. This might be a good time to stop and explain how AURYN works in the second half of the book. When the Childlike Empress gives AURYN to Bastian, she tells him that he must make a wish. He wishes to see the Childlike Empress (it's dark), and his wish comes true. After that, everything Bastian wishes comes true. He wishes to be handsome, and he becomes so. He wishes to be strong, fearless, powerful, exceptional, magnanimous. He becomes all of these things. But AURYN has a side effect. With each wish he makes, Bastian forgets one thing about his real life. First he forgets that he was ever fat and pale. Then he forgets that he was ever weak and afraid. Then he begins to forget the people in his life. He has no idea that this is happening, because he has also forgotten that he has forgotten. As Bastian moves along the path of his wishes, he loses more and more of himself. Bastian doesn't realize what is happening until he arrives at the City of Lost Emperors. There he discovers that he is only a few wishes away from being trapped in Fantastica forever. If he loses his last memories, AURYN will stop working, because its wish-granting power is fueled by memories. When Bastian's memories are gone, he will be unable to complete his path of wishes and find his way out of Fantastica. Not only that, but he will be doomed (like the many humans in the City of Lost Emperors) to a perpetual life of meaningless insanity. AURYN's double bind presented a problem when I was trying to understand the meaning of the ouroboros in The Neverending Story. If AURYN represents the blending of imagination and reality, how could it trap Bastian in his imagination? How could a doorway be a prison? Bastian was overjoyed. But just because so infinitely many possibilities had suddenly been held out to him, he couldn't think of a single wish. "I can't think of anything," he said finally. For a time there was silence. And then he heard the birdlike voice: "That's bad." "Because then there won't be any more Fantastica." Bastian made no answer. He felt confused. His sense of unlimited freedom was somewhat marred by the thought that everything depended on him. And then he makes his first wish -- and loses his first memory. The Childlike Empress gives him not the tiniest hint of the effect this is having on him. Everything depends on him. He is the savior of Fantastica. But is he nothing more than a sacrifice? Bastian had shown the lion the inscription on the reverse side of the Gem. "What do you suppose it means?" he asked. 'DO WHAT YOU WISH.' That must mean I can do anything I feel like. Don't you think so?" "How can I find out?" "By going the way of your wishes, from one to another, from first to last. It will take you to what you really and truly want." "That doesn't sound so hard," said Bastian. "It is the most dangerous of all journeys." "Why?" Bastian asked. "I'm not afraid." "That isn't it," Grograman rumbled. "It requires the greatest honesty and vigilance, because there's no other journey on which it's so easy to lose yourself forever." "Do you mean because our wishes aren't always good?" Bastian asked. The lion lashed the sand he was lying on with his tail. His ears lay flat, he screwed up his nose, and his eyes flashed fire. Involuntarily Bastian ducked when Grograman's voice once again made the earth tremble: "What do you know about wishes? How would you know what's good and what isn't?" It is the most dangerous of all journeys, as Bastian finds out later. "Oh well," said Bastian undismayed, "Moon Child must have known what she was doing when she gave me the amulet. You worry too much, Atreyu. I'm sure AURYN isn't a trap." Except that it is a trap. I had a very hard time making sense of this aspect of AURYN's power. If the Childlike Empress represents our ability to imagine, and if that ability is a good thing, why would she deceive Bastian in this way? Why doesn't she tell him up front that AURYN gives wishes and takes away memories? How could she be so cruel? "AURYN is the door that Bastian has been looking for. He carried it with him from the start." Wait, what? He could have left Fantastica at any time, simply by taking AURYN off and putting it down somewhere? Why didn't anybody tell him that? Unless somehow "he carried with him from the start" doesn't mean "he could have taken it off and gone home any time he wanted to." Maybe there was some minimal number of wishes he had to have granted before he could leave. Still, not telling Bastian how and when he could leave Fantastica makes it sound more like a prison than a wonderland. If you or I woke up in the most beautiful palace in the world, we would do a quick door check before we started exploring. In this light, Bastian seems more like the hapless victim of a well-planned seduction than the powerful creator of a new world. Later in the story, Atreyu and Falkor have a conversation about Bastian that has always fascinated me. "Falkor," Atreyu asked, "do you suppose the Childlike Empress cares what becomes of Bastian?" "Maybe not," said Falkor. "She draws no distinctions." "Then," said Atreyu, "she is really a . . ."
"Don't say it," Falkor broke in. "I know what you mean, but don't say it." I've long pondered what that word might be. It is often mentioned in The Neverending Story that the Childlike Empress is neither good nor evil. She is also said to make no distinctions among her subjects, favoring neither the good nor the evil. I originally took this as a warning that our imaginations can create helpful and harmful things with equal ease. But could it be worse than this? Could the Childlike Empress be the villain of The Neverending Story? For a brief moment I wondered if there might be no meaning in the deception, that it might simply serve to create suspense. But I discarded that idea pretty quickly. The whole book is an elaborate extended allegory. Michael Ende would not have used the dominant feature of the most central symbol of the book just to create narrative tension. It has to mean something deeper, something with a purpose. After rereading the important sections of the book concerning AURYN, the answer finally dawned on me. AURYN has a second, deeper meaning, a second ouroboros wrapped around the first. It represents the power and danger of stories. That is why the snakes on AURYN are white and black, just like a yin-yang symbol. Our imaginations can save us, and they can destroy us, and most critically, these two aspects cannot be separated. Thus neither the Childlike Empress nor Grograman can tell Bastian about the double-sided effects of AURYN's power, even if they want to. They aren't cruel or exploitative; they are merely powerless to remove the dangers of Bastian's journey through his imagination. If Bastian knows his memories are being eroded, he will refuse to take the journey, and he will go back to his life unchanged. He has to go into the process blindly in order to go through it at all. A fantasy is a journey. It is a journey into the subconscious mind, just as psychoanalysis is. Like psychoanalysis, it can be dangerous; and it will change you. The same thing could be said of any exploration into the world of personal storytelling, whether it happens on a therapist's couch or at your kitchen table. I see it when I help people work with their own stories. Working with stories holds risk and potential in equal measure, and you can't have one without the other. You have to take a leap of faith into the unknown, like Bastian did when he called out Moon Child's name. The Childlike Empress and Grograman are Bastian's personal story facilitators, and much as they would like to, they cannot intervene in the process without breaking it. In the days that followed Bastian thought a good deal about what the Many-Colored Death [Grograman] had said. There are some things, however, that we cannot fathom by thinking about them, but only by experience. So it was not until much later, after all manner of adventures, that he thought back on Grograman's words and began to understand them. This, then, is the second meaning of the ouroboros in The Neverending Story: the intermingled and inseparable power and danger of personal storytelling. When Bastian has received several obvious clues that he is the savior Fantastica has been waiting for, and he still refuses to give the Childlike Empress a new name, she undertakes an arduous journey to find The Old Man of Wandering Mountain. The Old Man sits in a giant egg halfway up a spire-like mountain and writes down everything that happens in Fantastica in a huge book. He represents those among us who transform stories from dynamic, living events into static, fixed artifacts. Hesitantly [Atreyu] asked: "Is he -- is he like you?" "He is like me," [the Childlike Empress] replied, "because he is my opposite in every way." I was confused by this conversation at first. I would have thought that the opposite of our ability to imagine would be the loss of that ability, which is already represented by the Childlike Empress' illness. But on reflection I think this is exactly what Ende means. The Old Man is the opposite of the Childlike Empress because he represents her death, even if it is to be followed by rebirth. When a work of the imagination is written down, it does die, in the sense of losing its ability to continue to grow and adapt to new conditions. This is in the nature of communication as we know it today, that we must package up our stories into dormant seeds, with only the hope that they will experience a rebirth in new minds. That's why it's fitting that Fantastica is reduced to a seed when Bastian receives it. Ende sees the creation of literature, that is, the transformation of dynamic imagination into static text, as a sort of death that an author can only hope leads to rebirth. FREEZE WHAT THE LIVING DID AND SAID. "You write down everything that happens," she said. This is an ingenious way of describing the transformation that occurs when stories are written down. The fact that oral peoples commonly and in all likelihood universally consider words to have magical potency is clearly tied in, at least unconsciously, with their sense of the word as necessarily spoken, sounded, and hence power-driven. Deeply typographic folk forget to think of words as primarily oral, as events, and hence as necessarily powered; for them, words tend rather to be assimilated to things, "out there" on a flat surface. Such "things" are not so readily associated with magic, for they are not actions, but are in a radical sense dead, though subject to dynamic resurrection. Ong wrote this particular quote in 1977, and Ende finished The Neverending Story in 1979. I have no idea whether Ende read Ong's writings, but he might not have needed to. I thought for a while that the Old Man of Wandering Mountain represented the transition between public and personal imagination within the land of Fantastica. I originally placed him on my diagram at the point in Bastian's journey where Bastian cries out "Moon Child" and enters into Fantastica. But I now think that was incorrect. 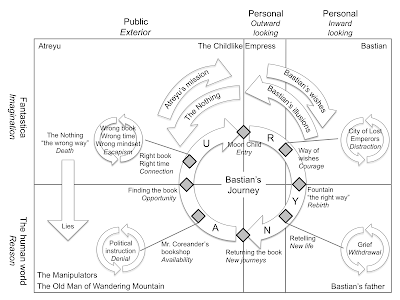 By placing such emphasis on the Old Man fixing the story in time, and by making the writing down of the story so important (with that ladder of letters), I think Ende meant to imply that the Old Man of Wandering Mountain is located at least partially in the human world, and is possibly a human himself. By this I think Ende meant to signify that a work can only enter the public imagination -- today -- by making its own journey out of Fantastica and through the human world. There is no longer a path that goes directly from personal to public imagination within the land of Fantastica. There might have once been such a path, when oral tales were handed down without being fixed in place. But in these literate times, written texts are the conduits through which public stories must pass. Even movies are written down before they are acted out. There is evidence for this transition from event to thing if we consider where Wandering Mountain is located. It can be found anywhere in Fantastica horizontally, but it juts up vertically, through the sky, to the human world. The human world is also seen above Fantastica later in the story, when Bastian uses the light of the stone Al-Tsahir to make the sky transparent so the Monks of Knowledge can see the attic of the school. I take this to mean that Wandering Mountain is a conduit between the worlds of our personal and public imaginations, but that the conduit must pass through the world of reality by becoming one of Ong's "things" -- like a book. This makes it even more clear why Ende insisted on having his physical book resemble his fictional book so closely. He meant to represent another journey in which the story itself makes a cycle -- from event to thing and back to event again -- in order to draw Bastian, and us, into the neverending story of stories. Bastian finds The Neverending Story in Mr. Coreander's bookshop, which itself seems a magical place. Its "long, narrow room, the back of which was lost in the half-light" is a place of beckoning mystery. The smoke rings Mr. Coreander blows from his pipe are like "the smoke signals that Indians used for sending news from hilltop to hilltop." Mr. Coreander and his shop send a message to Bastian, and to us, about stories and the imagination. My guess is that Michael Ende saw himself as a combination of the Old Man of Wandering Mountain and Mr. Coreander. Both men are necessary for Bastian's journey to take place. One provides the book itself, and the other makes the book (and others like it) accessible. If men like Mr. Coreander didn't exist, if all the bookshops in the world were filled with nothing but "socially conscious and politically instructive" works of non-fiction, Bastian could never have gone on his journey. Michael Ende became increasingly interested in the entertainer’s dual role as a joker and conjurer. For him, the figure of the joker embodied the playful element in art that served to bring people closer together. ... The role of the conjurer was rather different. Ende believed that every artist, writer or creative person was a kind of magician, conjuring something out of nothing by creating fictional worlds and people, inventing stories and experiences and making new connections. The joker was the facilitator, while the conjuror was the creator. Both aspects were united in the figure of the entertainer, the artist par excellence. The Old Man of Wandering Mountain is the conjuror of The Neverending Story, and Mr. Coreander is its joker, the facilitator of Bastian's journey. I suspect that Mr. Coreander did not mind Bastian's "stealing" the book, being an old Fantastica hand himself. In fact, I suspect that he left the book where he did so Bastian could pick it up. Did you notice that Mr. Coreander's telephone happened to ring the moment after Bastian mentioned his mother's death? Why did the phone ring at just that moment? Did it ring because Mr. Coreander decided Bastian needed the book he was reading? It's possible. I have no children's books and I wouldn't sell you the other kind. He says this while holding, and presumably having been interrupted while reading, The Neverending Story, a children's book. Later, when Bastian brings the book back at the end of the novel, Mr. Coreander claims not to recognize it. This also has to be a lie, since he was reading the book when Bastian came into the shop. Second, Ende meant The Neverending Story (both versions) to stand in contrast with two distinct types of book he did not want to write. One is the "mere escapist" fantasy novel people accused Ende of writing for children (though he never wrote escapism, and he never wrote only for children). The "other kind" of book is the "socially conscious and politically instructive" book people wanted Ende to write for children. This leads us into consideration of the Manipulators. Quite a few reviews of The Neverending Story mention the similarity between its Manipulators and the grey men in Ende's novel Momo. It's true that both groups are indistinct, other-worldly, and obsessed with obtaining control. But Momo's grey men are the up-front antagonists of Momo, whereas the Manipulators of The Neverending Story play only a bit part. They are never described, only mentioned, and infrequently so. "Who knows what use they [the Manipulators] will make of you? Maybe you'll help them persuade people to buy things they don't need, or hate things they know nothing about, or hold beliefs that make them easy to handle, or doubt the truths that might save them. Yes, you little Fantastican, big things will be done in the human world with your help, wars started, empires founded . . ."
[In Nazi Germany] There was ... an enormous effort made by educators, party functionaries, and literary critics to revamp the interpretation of the tales in accordance with Nazi ideology and to use these interpretations in socializing children. ... Aside from obvious anti-Semitic explications of such tales as "The Jew in the Thorn" or the association of thievery and cheating with Jews, most of the National Socialist interpretations stressed the struggle between two worlds: the pure Aryan world versus the contaminated alien world. Michael Ende was one of those "socialized" children, and he grew up to question simplistic views of contamination by "alien" thoughts and traditions. The way his contorted, soulless Fantasticans convulsively jerk toward the Nothing bears a resemblance to the grotesque distortions the Nazis created out of authentic German folklore. Still, Ende chose not to make the Manipulators a strong element in The Neverending Story. He depicts them as weak, grasping opportunists, vultures feasting on the "living corpses" of imaginary creatures. They are unable to enter Fantastica, presumably because they have no imaginations of their own. They can do nothing but stand and wait for Fantasticans to fall into the Nothing, which they didn't (and couldn't) create on their own. I believe this is Ende's comment on the ultimate failure of attempts to exploit the public imagination for the purpose of control. I find it particularly fascinating that even though the Childlike Empress refers to Gmork, she never mentions the Manipulators. She seems detached and diplomatic about the whole situation, saying, "Just as our two worlds can injure each other, they can also make each other whole again." She and the Manipulators sound like rival politicians criticizing each other obliquely, or like former spouses trying to speak carefully about each other in front of the children. Gmork, the werewolf servant of the Manipulators, comes into the story a bit more, but his attempt to stop Atreyu's quest is half-hearted. He's less of a threat than the Swamps of Sadness or Ygramul the Many. The Childlike Empress calls Gmork "a half-and-half creature" who told Atreyu "only half the truth." What does Gmork represent? I can't find anything that makes sense, and I've had to succumb to the possibility that Gmork represents nothing but an opportunity to tell us about the Manipulators. At first I thought Gmork might represent our doubts and fears about imagination -- that it's silly, or for children and old women only. But if that were true, Gmork would have confronted Atreyu and taunted him instead of giving him an academic lecture about manipulative lies. Or he would have directly addressed Bastian, increasing his fears that the book wasn't really about him or that he didn't deserve to rename the Childlike Empress. But none of those things happened. Atreyu didn't meet Gmork until his mission had failed (so he thought), and Gmork did nothing but educate him about the Manipulators. For a while I thought Gmork and the Manipulators might represent (or also represent) those who appropriate products of the public or personal imagination to create escapist fantasies, something Ende was accused of doing. I think I would have liked that, but I can find no evidence of it in what Ende actually wrote. He does condemn those who use stories to "persuade people to buy things they don't need," but there is no hint of the commodification of stories themselves for packaged entertainment. Surely he had to be aware of this phenomenon, since Disney had been hard at work appropriating folk tales for commercial profit long before 1979. I wonder if he felt he could not criticize this use of stories since he made his living selling story books. Or maybe he felt that it was a lesser evil than the use of stories as propaganda, and he wanted to use his opportunity to push that point more forcefully. I can certainly agree with that stance. The sorceress Xayide is a prominent character in the second half of the book. She represents those who seek to gain from our need to explore our personal imaginations. Xayide is the counterpart to the Manipulators in the world of the personal. She pretends to submit to Bastian as his loyal slave, knowing all along that this is the best way to enslave him. Xayide conjures up images of unscrupulous counselors, professional hangers-on: therapists who string out their sessions with patients to finance their careers; purveyors of snake-oil remedies worse than the diseases they purport to cure; people who pay more attention to their fame than to those they claim to help; hypocrites who claim to believe religious or philosophical truths but in reality seek only fame and fortune. [Michael Ende] shared his parents’ interest in Rudolf Steiner and his work, but ... his worldview wasn’t shaped by Steiner’s anthroposophy alone. ... [He] looked for truth in the writings of other sages and mystics, including Christian Rosenkreutz’s Chymical Wedding, Aleister Crowley’s manifestos, Indian and Egyptian belief systems, Zen, Kabala, Swedenborg, Eliphas Lévi, Sören Kierkegaard and Friedrich Weinreb. But he could never have become anyone’s disciple: a closed perspective on the world and the afterlife would have stifled him. I'm not sure who wrote this; the people who maintain Ende's web site seem to be a mix of authors and publishers. But in this statement I read a message that Ende either felt pressure to conform to particular philosophical worldviews or experienced criticism that his writings were based on such views. This gives me grounds, I think, to guess that Xayide might be a reference to people with "closed perspectives" who gather disciples and stifle the authentic, and authentically diverse, exploration of the personal imagination. It's true, as many have pointed out, that "Moon Child" is the title of Aleister Crowley's 1917 novel, and that Crowley was the founder of the mystical Thelema movement. But I don't think Ende meant the name as an homage to Crowley. When he wants to reference something particular in The Neverending Story, he carefully chooses his words; but "Moon Child" is not introduced into the book in a careful way. Bastian just seems to come up with it out of the blue. There's no explanation given for why it's a mystically appropriate name for the Childlike Empress, or for what it might mean to Bastian. Maybe Ende just liked the sound of it. There are other references to mystical traditions in The Neverending Story, and it's hard to guess whether Ende meant to recommend them or criticize them. The central law of Thelema is "Do what thou wilt," and its adherents are advised to seek out their "true will," which sounds like "what you really and truly want." But on the other hand, Ende called Crowley "devious" (abwegige) in a 1988 letter to Werner Zuhrfluh. That would place Crowley closest to Xayide in the story. And Thelema's "do what thou wilt" seems closer to Bastian's misuse of Sikanda and Al Tsahir ("if your will makes you draw it from its sheath"), and his thwarted attempts to control the Childlike Empress, than to the true meaning of AURYN. My guess is that Ende meant to praise and criticize mystical traditions. I wonder if he meant to apply the ouroboros symbol to all religious and philosophical traditions. All ritualistic means of exploring our psyches and the cosmos can help us in our journeys, and all such means can drain our energy and trap us in pointless fantasies. It depends on who is taking the journey and what companions they find to aid or hinder them on their way. The last major player in the story is Bastian's father. As the story begins, Mr. Bux has withdrawn into an endless cycle of grief, far from his son and far from his own imagination. In his withdrawal Mr. Bux has found some relief from pain, but he has mired himself and his son in similar but never-touching cycles of featureless endurance. There are signs early on in the book that Bastian wants to break out of his own cycle of avoidance, but he doesn't want to leave his father behind. Bastian describes early in the book how his father has withdrawn from him and from life. There was an invisible wall around his father, and no one could get through to him. ... Bastian felt that as far as his father was concerned he wasn't there at all. [W]hen they both sat there with books, Bastian saw that his father wasn't reading at all. He'd been looking at the same page for hours and had forgotten to turn it. Bastian's father is not only isolated from Bastian; he is isolated from life itself. He is caught in a holding pattern between life and death, pretending to turn the pages of his life. It's also telling that Bastian pictures him amidst "plaster casts of human teeth," because these also are dead things that mimic life. When Bastian returns from Fantastica, we learn that his father has been on a journey as well. "I looked for you all day and all night, my boy. I feared the worst, I put the police on your trail. Oh God, Bastian! What happened? I've been half crazy with worry. Where have you been?" The energy with which Bastian's father says these words is shocking, given that his image has been so passive throughout the book. He seemed frozen in time, and now he is in motion. It turns out that Bastian's father has gone through his own transformation. Now he is wide awake and ready to join Bastian on a new journey. But it is not the book or its magic that helps Bastian and his father return to Fantastica. It is Mr. Bux's willingness to listen and engage with his son that opens the door. If Mr. Bux had not listened to Bastian's story or had not taken it seriously, the opportunity to go back to Fantastica would have closed for both of them. Because he listens and opens his mind, Bastian's father undergoes his own rebirth into a new life of engagement with his son, and, it is implied, with his own personal imagination. To me, the most significant passage in the whole book comes just after Bastian has finished telling his father what happened to him in Fantastica. It was almost dark in the kitchen. His father sat motionless. Bastian stood up and switched on the light. And then he saw something he had never seen before. He saw tears in his father's eyes. And he knew that he had brought him the Water of Life after all. These words always make me tear up. This is the point of the whole story. This is what Michael Ende wanted us to know. It is only the journey through the imagination, public to personal, general to specific, safe to dangerous and back again, that can save us all. This is not an escape from life; this is life itself. Hello Peter! I'm so glad you're going to read _The Neverending Story_ again first. I do think the essay is more enjoyable just after you've come out of the book! Best wishes with your move. Bless you for writing this! I listened to the Neverending Story audiobook last week, and I've felt a little shaken--- traumatized, even--- since then. There are so many horrifying implications in this book, I haven't been able to untangle everything. Now on to Part 2! Thank you, Rebekah. I hope what I've written can be useful to people making sense of Ende's masterpiece. I'd be grateful for any feedback you have on the essay.